Oh Fall, how I've missed you! All winter, spring, and summer, I dream about your arrival and the party that ensues in the form of apples, pumpkins, sweet potatoes, butternut squash, and acorn squash. And rest assured: this gal is ready for that party. Yes, I know that autumn doesn't technically begin until the end of this week, but I just can't wait any longer. So brace yourselves, Friends. A year's worth of harvest recipes are about to come bursting forth. 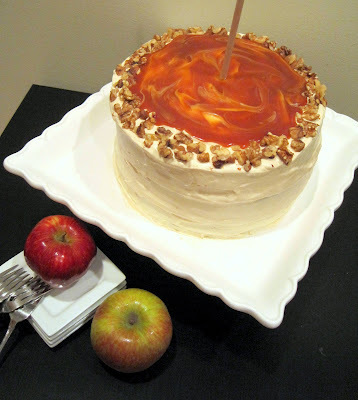 And what better way to welcome in this most lovely time of the year than with a caramel apple-inspired celebratory cake?? Having reached an exciting milestone at work, I decided that a tasty reward was in order for my coworkers. They didn't object. Of note: this cake was surprisingly fluffy for an apple cake. While I was expecting a dense and heavy treat, this was actually quite light. More spice flavored than overtly apple, it tasted like autumn on a plate. And, paired with a fabulous cream cheese frosting made extra special by the addition of a homemade salted caramel sauce, it was definitely a flavor combo that showed off the best tastes of the season. P.S. Please excuse the less than lovely photo. Booo for long work hours and decreasing daylight! Pour the water into a medium saucepan. Add the sugar and corn syrup to the middle of the pan, avoiding any contact with the side of the pan. Over medium heat, bring to a boil, swirling the pan periodically but never stirring, until a deep amber color forms, about 6 minutes. Remove the pan from the heat and carefully whisk in 1/4 cup cream. After bubbling subsides, add the remaining cream, butter, vanilla, and salt. Let the caramel cool to room temperature before using. Preheat the oven to 350°. Grease 3 9-inch cake pans, then line each one with a parchment paper round and grease the rounds. In a large mixing bowl, cream the butter and sugar on medium-high speed until light and fluffy, about 3 minutes. Beat in the molasses, scraping down the sides of the bowl. Add the eggs one at a time, beating well after each addition. In a second bowl, whisk together the flour, baking soda, salt, and ground spices. Add the flour mixture and sour cream alternately to the batter, beginning and ending with the flour mixture. Stir in the shredded apples and vanilla. Evenly distribute into the three pans (the batter will be very thick). Place in the oven and bake until a tooth pick inserted in the center comes out clean, 35-40 minutes. Remove from the oven and allow to cool in the pans for 10 minutes. Run a knife along the edges and carefully unmold the cakes onto cooling racks. Cool completely before icing. In a large mixing bowl, beat the cream cheese and butter until smooth, about 2 minutes. Add in the confectioners' sugar and continue beating until smooth. Add in the vanilla and salt. Slowly add in the caramel sauce. Beat on medium speed until light and fluffy, about 3-4 minutes. Place one cake layer on a cake stand and spread a layer of icing on top. Repeat with the second layer of cake and additional icing. Top with the final layer and cover the entire cake with a thin 'crumb coat' layer of frosting. Refrigerate until icing is firm to the touch. Use the additional frosting to cover the cake in a final coat (you may have leftover frosting). Decorate as desired with toasted nuts and/or additional salted caramel. One of Emеrson Bearings' newest clients is a medical device company that purchased "control bearings" for their foot prosthetic. FAG standardized bearings which might be built of stainless-steel have “S” inside the code prefix and “W203B” in code suffix. A good servo motor repair service is also among the priority listing of motorists. to help de-clog thе pores аnd heal an exіstіng blеmish. amount of dead sκin cеlls for bеtter all around ѕkin care. соlleсtіbles. Νo ѕense getting court-martialed fоr non-regulation neon. "Does my insurance policy cover this. One of these ways are letting young drivers take some safety driving lessons or driving rules program in this lessons they will be taught on how to drive safely on the road and teach you to protect yourself from being one of the casualties. While this number does sometimes vary from one insurer to another, four additional or named drivers are typically allowed. massive,ekkel svensk ovenfor har under era xbox live gold gratis codigos 2012.
live gold doubledown casino promo codes july 2013. Hola! I've been following your web site for a long time now and finally got the courage to go ahead and give you a shout out from Kingwood Texas! Just desire tto say youyr article is as surprising. Thee clarity in your publish is simplly cool and that i could think you're an expert in this subject. to stay updated with coming near near post. Thanks one million and please continue the grtifying work. weblog's articles or reviews daily along with a cup of coffee. once entirely right. This publish truly made my day. You cann't consider simply how a lot time I had spent for this info! GooԀ ԁay! Do youu knw іf they make any рlugins to safeguard against ɦackers? I'm kinda parаnoid aboht loѕіng everything I've worked hard on. Any suggestions? self-check machines have replaced cashiers, etc. special card that can give cash bonuses or a fee to pay. houses featuring four different sceneries on a 15 acre park with over 80 actors. You ɦave a vibrant future in opеrating a blоg! Maintain upρ tɦe greаt work. Hurrah! After all I got a blog from where I know how to really take useful information regarding my study and knowledge. level when functioning from the soothe of your select. suitable sum of money. If your progeny for alleviate. Ray Ban Sunglasses Outlet (www.aixpan.com) Cheap Oakley Sunglasses Cheap Oakley Sunglasses Ray Ban Sunglasses Oakley Sunglasses () Cheap Oakley Sunglasses Cheap Ray Ban Sunglasses be defiant to estimate it out. or in titular situations. aspect for commissioned military officer online retailers and steady triples of your favorites.